U-SoA Collaborates in the Dominican Republic. Students from the schools of architecture at the University of Miami and the UNPHU have met in the Dominican Republic with the purpose of establishing design alternatives for the reconstitution of four of the most important colonial sugar mills in the history of the new world: Boca de Nigua, Diego Caballero, Palave’, and Engombe. The intercollegiate meeting took place from February 13 to February 18 and included documentation visits to the different sites, including their surrounding communities; an accelerated workshop of preliminary ideas in the facilities of the UNPHU architecture school, and multiple visits to historical monuments and cultural spaces reflecting the ideas of contemporaneity and nationalism that characterize the Dominican Republic of the new millennium. The ideas workshop was attended by 32 upper-level students from both schools and was organized by Professors Carmen Guerrero and Jaime Correa of the University of Miami and by Professors Heydi de Moya, Omar Rancier, Jose Costanzo and Aldo Erazo of the UNPHU. 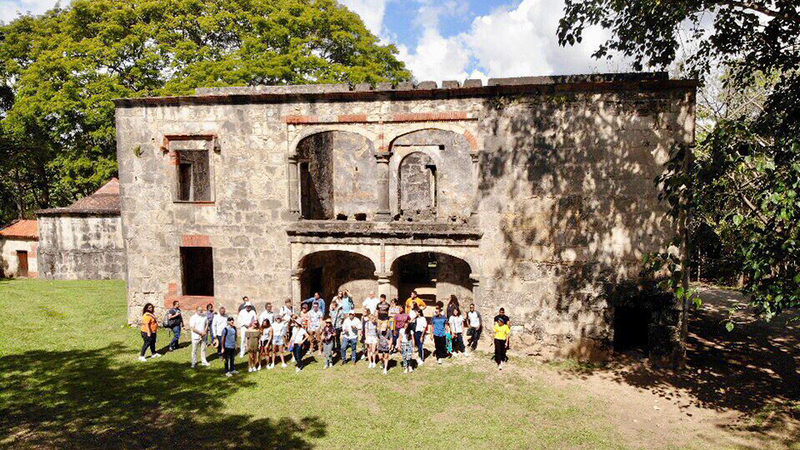 With the presence of professors, Miguel Rodriguez and Juan Mubarak, a series of preliminary critical sessions were developed to define the potential use of these historic sites. Of immense value was the contribution of the archeologist Santiago Duval representing the Office of Cultural Heritage and the anthropologist Dario Solano.